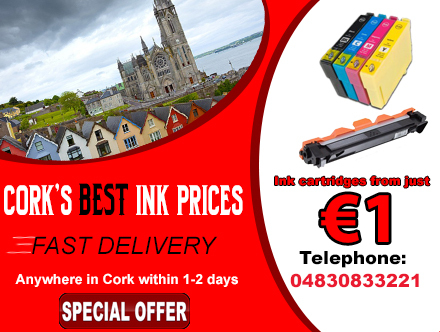 Where can I buy Canon Ink Cartridges in Cork? has grown substantially and in particular demand for the compatible cartridges. Many retailers and ink shops stock both the compatible and genuine version. The popular Pixma range of printers is best known for it’s high quality print outs and with over 200 models in this range, the demand for good quality ink cartridges is high. Searching on-line will put you in touch with all the ink shops and a quick call to each of them will give you an idea of the prices locally. Don’t discount the Irish based on-line suppliers many who will deliver next day and give unbeatable offers that the high street shops can’t match. Rewarding customers for their loyalty by offering discounts or giving free gifts with orders has become more popular within the compatible ink on-line market in Ireland. The Canon inkjet cartridges on offer on-line very often will include free black cartridge when a full set of cartridges is purchased. A high street ink shop is unlikely to offer this level of offer although may offer to refill your ink cartridges instead for less than the cost of an original brand. How many times can you refill a Canon inkjet ? Well the honest answer is from as little as twice to a maximum of 5 times. There is no guarantee that the cartridges will work when they are refilled and it’s quite likely that the volume levels won’t display but this doesn’t affect the quality of the print outs. One of most important things to consider if you are removing a ink cartridge with an integrated print head with the intention of getting it refilled is not to cause any damage to the copper ‘chip’ area. Even the natural oil from your hands can cause damage and prevent the cartridge from being recognised. The contacts on the ‘chip’ are one of the areas of the cartridge that can wear out or cease to function after a couple of refills. The ink shop in Cork that refills your cartridges will make you aware of all the dangers of handling an ink cartridge that you would to have refilled. The Canon printers that have the print heads in the printers as opposed to the cartridges are not generally refillable and as they are low cost are relatively cheap to replace with the compatible version.